Those that know me know that I am a hat guy. For a couple of years now I have been looking for a great summer hat. I have a wide brimmed Tilley, which is great for hiking and walks but needed a good everyday summer hat. On Saturday Teena and I were at the Pan American Food Festival and it was there that I finally found it. The perfect summer hat! Of course, I bought it with no hesitation! There was a problem, though. The black hat band was not glued or sewed on, so it fell off and was lost the very next day! The owner of Aborigen, the company I bought the hat from, was quite cooperative saying that if I could not get to his store in Woodbridge that he comes downtown a few times a week and would call me the next time and let me choose from a variety of headband. I don't have a cellphone and am tied to my desk most of the day so instead after work I dropped into Lilliput Hats on College Street by Bathurst. It was a typical old fashioned hat shop with hats on display at the front and hat blocks and sewing machines out in the open at the back. I loved the atmosphere! Instead of just buying a hatband, I was presented with materials of different colours and widths to choose from, plus asked how I would like the band finished, bow (no), folded or pinned. I chose folded and the size of the fold. They said it would be ready in two days and be properly sewn to the hat. The very next afternoon there was a message on my phone that it was ready. I picked up the hate last night and it looked great, plus the band is very secure. Now that's service! 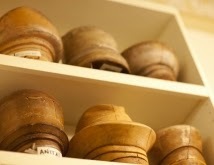 Lilliput not only sells and repairs hats but they will make a custom hat from scratch. This is something I have to do!